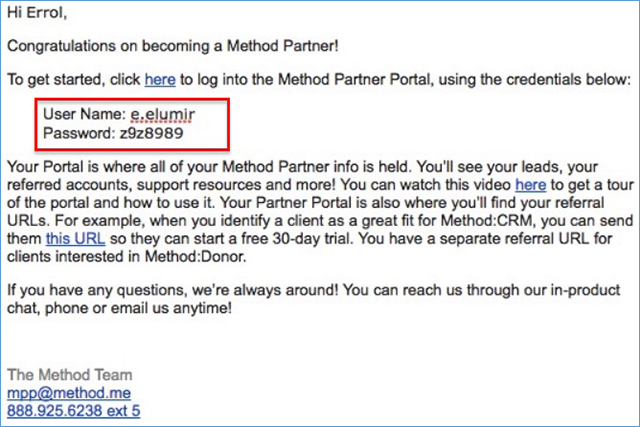 This article contains info for existing Method Partners! 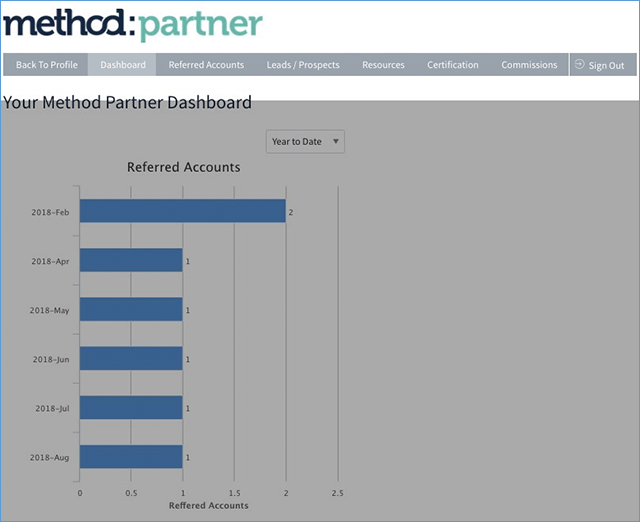 Your Partner Portal is where all of your Method Partner info is held. There, you’ll see your leads, your referred accounts, resources, commission details and more! A dedicated link is needed to access the new Partner portal. If you joined the Partner program on or after Sep-24-2018, your "Welcome" email will include some important info along with initial details and link to access your partner portal. In an email announcing the new Partner portal sent on Sep-24-2018. Part of your "Welcome" email sent to new partners joining on Sep-24-2018 or later. OR you can request we provide this by email to mpp@method.me. If prompted to log in, use the email linked with our Partner program. Note: For additional help, reference this article or email mpp@method.me. At this point, you should be successfully logged in to the portal and you will see one of two views. Your link may have directed you to a section of the portal showing your profile with us. If so, you should see a button from the Home tab to Access Partner Portal. Clicking this will bring you to the section of the portal showing your Partner specific details. 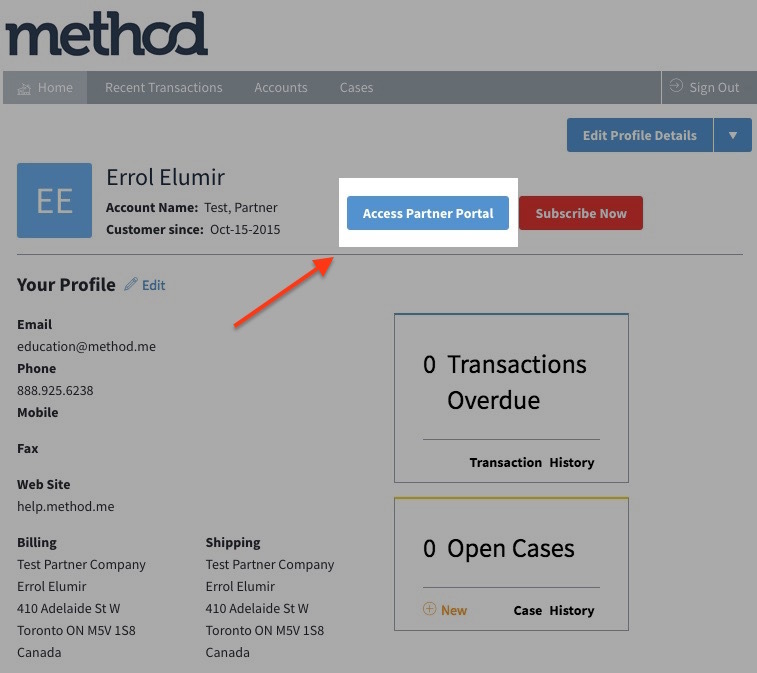 Note: If you are an active Partner but do not see the "Access Partner Portal" button above, please email mpp@method.me so we can look into your Partner profile. Your link may have already directed you to a section of the portal showing your Partner specific details. Note: We've built a new and better Partner portal and we suggest accessing that new portal (see the section above) or contacting our partner team if you need to gain access. If you joined the Partner program before Sep-24-2018, your "Welcome" email to the Partner program will include some important info along with initial details and credentials on how to access your partner portal. Navigate to www.method.me/partnerlogin We suggest you bookmark this link. Enter your username and password (found in your welcome email). Note: Use the Forgot Your Password Option if needed or email mpp@method.me. At this point, you should be successfully logged in to the Partner portal.